I felt myself quite fortunate to stumble across this “find”. 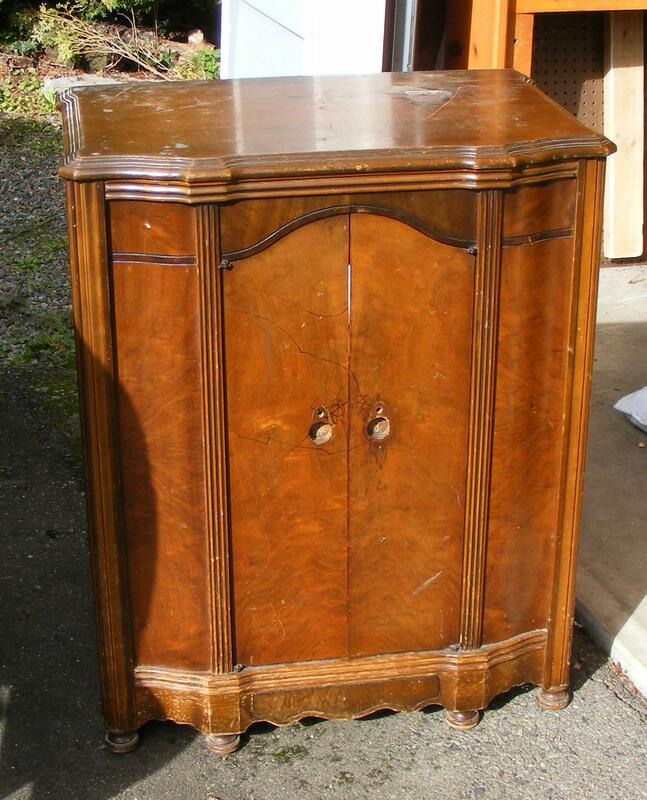 It’s an old RCA Victor cabinet that has had a very difficult life – as you can see, it has been stripped of all its components and gizmos, it is backless, the whole bottom frame the cabinet was ‘born’ with had been removed, the front knobs were missing and the front had been decorated by a small child who had joyfully found a felt marker, and the whole piece is just generally pretty sad and battered. But I look at it and see the beautiful lines it has and I see a magnificent bar cabinet all gorgeous and gloriously refinished. I can hardly wait! 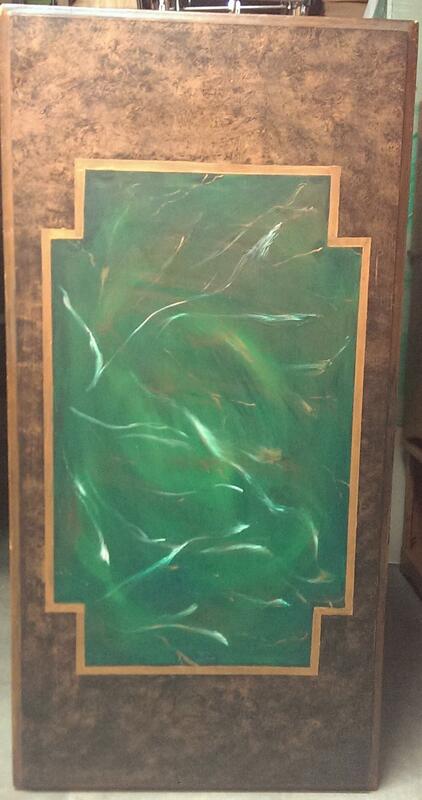 Right now, my plans are to clean up and repair the top, then I’m going to cover the top with a leather pad. The body will be generally cleaned up and restored. The inside will be stripped out and redone, the front side panels will be covered with a black and copper Art Deco imprinted paper, the knobs will be replaced with something beautiful – possibly with a mortise lock. The inside back will have mirrored glass. When we moved into the new house, we needed more space for kitchen gadgets and dishes. So I found a suitable sideboard on Craigslist, but it was this terribly dated boring piece (upper left corner of the picture), that desperately needed a new life. Since I was missing Colorado, I saw the ‘bars’ on the doors and immediately thought ASPEN TREES!!! 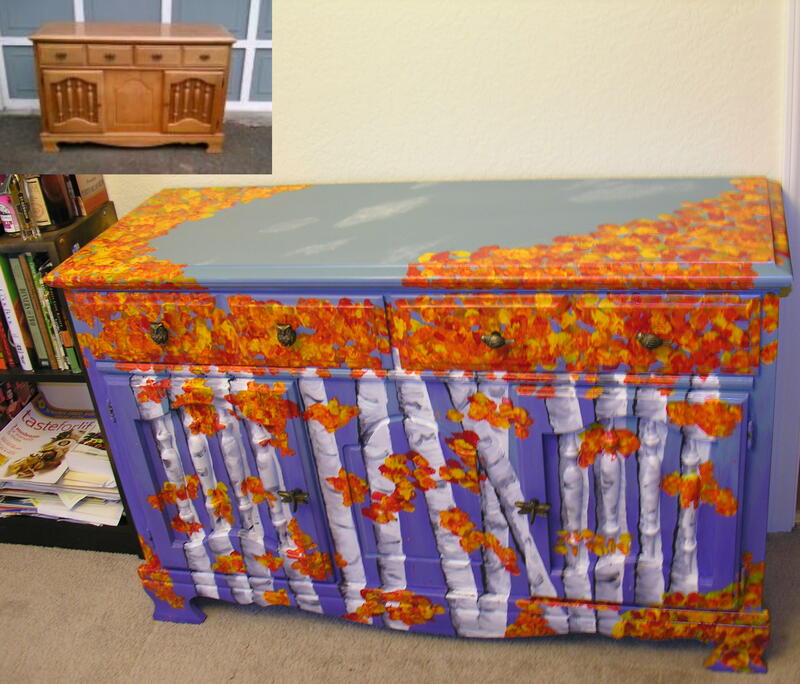 So here is my sideboard/dresser with its fall aspen leaves! So my latest FINISHED project (as opposed to the gazillion UFO projects still “in process”) is this piano bench redo I’m rather proud of. We wanted a bench for our bedroom and I was deeply in love with this turquoise crocodile-embossed fabric. 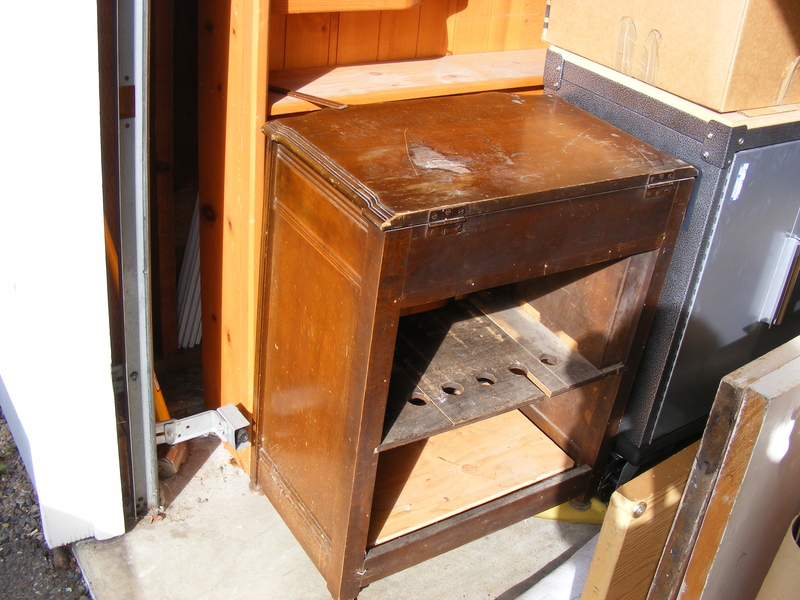 I haunted Craigslist and Goodwill and other sources for AGES trying to find a bench, before remembering that I had this old piano bench I’d stuffed away in the basement – always intending to give it a makeover. So I primed it with RustOleum’s Painter’s Touch 2x Primer and Paint, then gave it a coat or two of their Bright Finish in Chrome for a really nice silver. To be honest, I was not thrilled with either paint, and will try something else next time. I then mixed up some acrylic paint to match the turquoise fabric, and painted the grooves in the legs – painstaking, but totally worth it! !